Last week’s produce box from my Tara Firma Farms review included a wide variety of lesser known produce, namely two different types of spinach plus another green that looked like thyme but I have no idea what it was to this day! As I reflect on my first three produce box reviews, I have noticed differences between the delivery services. At the end of this project I will provide a ranking that I hope will be a local reference for those seeking farm deliveries. And now, for my Full Belly Farm review! 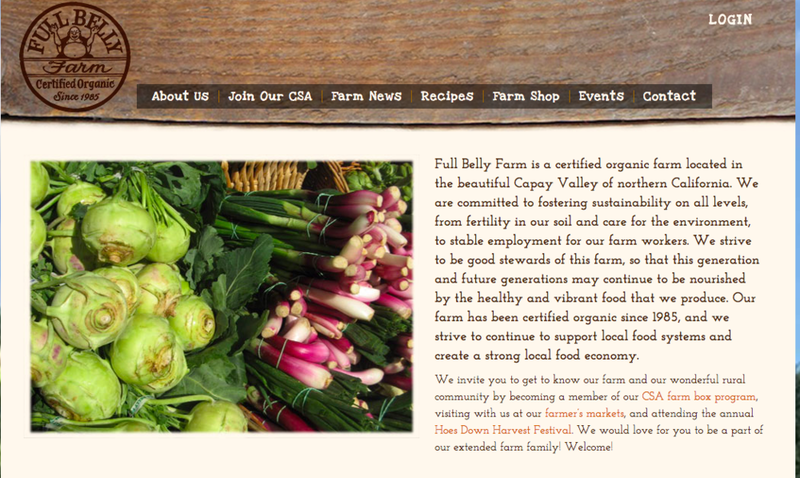 Full Belly Farm is located in the Capay Valley of California, similar to the location of Farm Fresh To You. The 400-acre farm has been operating as a certified organic farm since 1985. 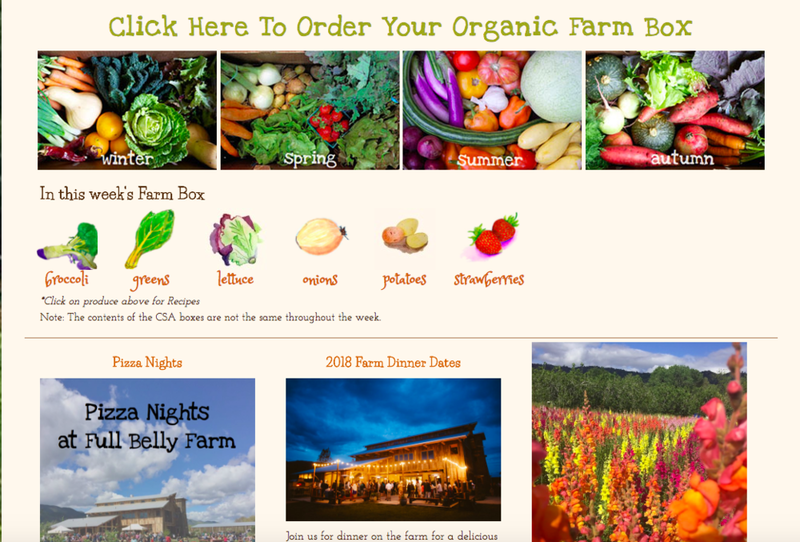 Their CSA program offers vegetables, fruits, herbs, nuts, preserves, baked goods, oils, and seasonal organic floral bouquets, all of which originate from their farm. Full Belly Farm hosts many activities and tours for locals, such as pizza nights and farm dinners. These events aim to communicate the importance of sustainable farming for our generation and to set standards for generations to come. Before I started my Full Belly Farm review, I spent some time perusing the website which was filled with photographs of their produce and farmland. The section named "In this week's farm box" provided a list of produce found in the current CSA box. Each listed item was hyperlinked to additional literature on the produce including storage suggestions, preparation tips, and recipe ideas. The site offers one size box that they claim feeds a family of 2-3, depending on the cooking frequency of the individual, so no need to make any decisions regarding the box size. Add-ons: A variety of products made at the farm such as preserves, baked goods, grains, oils and nuts. Full Belly Farm allowed me to specify my start date and frequency of delivery with a minimum commitment of 4 boxes. The Farm also permitted me to skip a week, cancel a week, or donate a week’s box to the Good Food Community Fund. For my Full Belly Farm review, I opted for a starter box at $76 (for 4 pick ups), with a frequency of one per month. Plus, I added on a jar of quince butter to kick off the first week. After the four week commitment, Full Belly Farm made it quite easy to cancel the service. Although not featured on the website, I received an email stating that organic pasture-razed animal products are available to current CSA members as well. There was not much customization available for my Full Belly Farm review in terms of item to item substitution: the farm selected that which I received, and told me each box would contain a mix of well-known and lesser-known items. There was a seasonal crop timeline where I could view what would potentially arrive in my CSA-box. For my Full Belly Farm review, I had the option of choosing home/office delivery (an additional $7 per week) or pick up at one of several locations throughout the greater Bay Area and Sacramento. I opted to pick up my box, as this method had proven to be very seamless and efficient for me thus far. When I placed my order I immediately received an email confirming my pick up location with detailed protocol instructions. The day before my pick up, an email newsletter was sent that listed the produce I would receive. It also included storage tips and recipes. That same day a farm representative rang me on the telephone and provided me with a point of reference in case I had any questions about the CSA, the pick up, or the process as a whole. I arrived at my pick up site. Opening up the gray box with my name on it, I saw a variety of fresh produce items that were waiting for me to take home. I carefully placed each of the seven items, plus my quince butter, into a cloth bag I had brought with me (Full Belly Farm reuses their plastic shipping boxes). Each item looked exactly how I expected them to look: vibrant, bountiful, colorful, and fresh. Collard Greens: A stack of flat, dark green leaves that spanned more distance than if I were to stretch my fingers out really wide in all directions. Romaine Lettuce: A full bunch of delicate, water-filled leaves - a few leaves fell off in transit. Broccoli: Broccoli florets have looked sparse at my local grocery store as of late, so I was extremely pumped to see that this head of broccoli was fully sprouted. Onion: I received one spring onion with its green tops still sprouting from the bulb. I thought about ways in which I could use the entire veggie, tops and all! 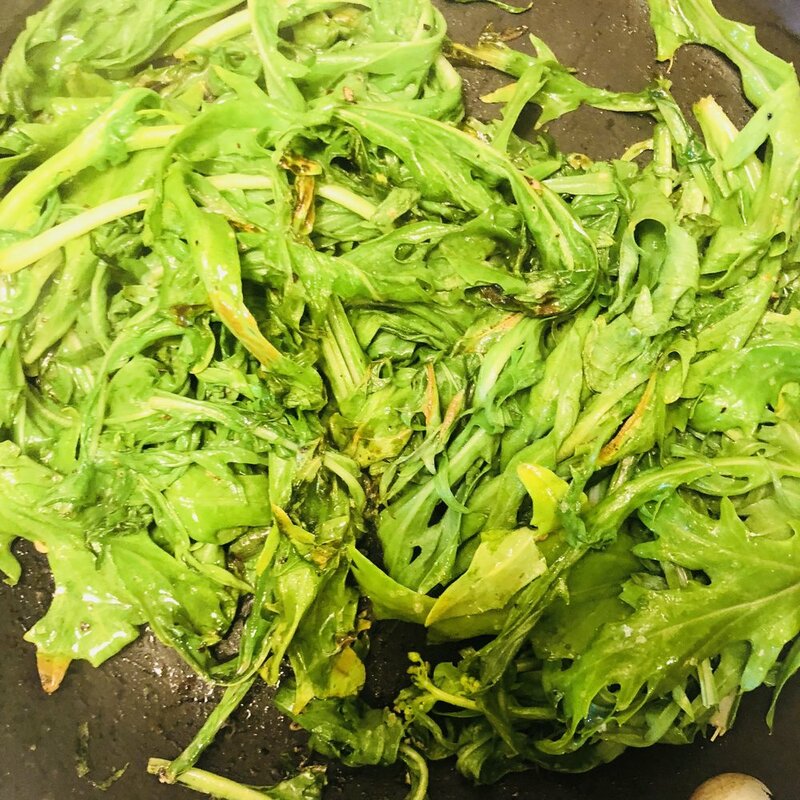 Mizuna: I had never heard of this type of lettuce prior to my Full Belly Farm review, but thanks to the information provided on the website, I received it with an existing knowledge base. New Potatoes: Two handfuls of these little gems, all of which had a thin skin and a beautiful earthy red color to them. I was told by The Farm to put them right into my fridge, and that is exactly what I did upon returning home. Strawberries: Big, bold and beautiful, these red, delicious babes are going to be such a treat this week. Praise strawberry season! Quince Butter: This was my add on - they make the butter at the farm. I had never tasted quince, but I read that quince butter is very similar to apple butter, of which I am a huge fan. I can’t wait to test it out on some baked goods! What a great selection, especially for $19! I set up my produce from my Full Belly Farm review on a shelf in my fridge and got to planning some meals! Full Belly Farm review produce in my fridge. I sautéed the collard greens with some chopped garlic and onion and let it simmer in a cup of vegetable broth, salt, pepper, and red pepper flakes for about 40 minutes or until tender. Boy did they melt in my mouth when I took a bite. A few of the fresh strawberries did not even make it to the fridge (I consumed them immediately after a quick rinse), but the remaining beauties were sliced and became the star ingredient in my vegan pancakes. It didn't take long for me to open up my jar of quince butter. On day one of receiving my box for my Full Belly Farm review I whipped up a batch of vegan and gluten-free biscuits and layered some quince butter on a few for a satisfying snack that was easy to digest. My biscuits were not super fluffy, but they had a great hard exterior with a doughy interior that satisfied my carb craving. I used a rice-based flour and chilled coconut milk as the main ingredients for these. I pulled a package of Trader Joe’s Quinoa & Brown Rice spaghetti from the pantry, grabbed my broccoli from my Full Belly Farm review box, and whipped up a really easy and flavorful recipe The Farm had listed on their website: Pasta with Broccoli Pesto. I followed the recipe pretty closely, although I subbed out the heavy cream for unsweetened almond milk and nixed the parmesan cheese. This dish boasted a ton of flavor and was a super innovative way to consume my veggies. I have enjoyed creating pasta sauces with different vegetables recently. Think about the numerous types of vegetable sauces that could be made possible! I’m totally in to it. I played around with this concept a few weeks ago with these beautiful green carrot tops and I loved the flavorful result. I wanted to take the batch of strawberries I received as part of my Full Belly Farm review and eat them whole, one after another, until they were all gone and in my belly. But I refrained and decided to construct some pancakes. I went through a few iterations to find a pretty well-balanced pancake recipe that delivered a smooth and moist consistency. After I made my batter, I formed small pancakes in my pan. Pre-pancake flip, I added some sliced strawberries which became soft like jam once it was time for the pancake to land on my plate. This recipe could not have been easier to execute. I am very grateful for strawberry season and for living in a region where fresh strawberries are everywhere this time of year. 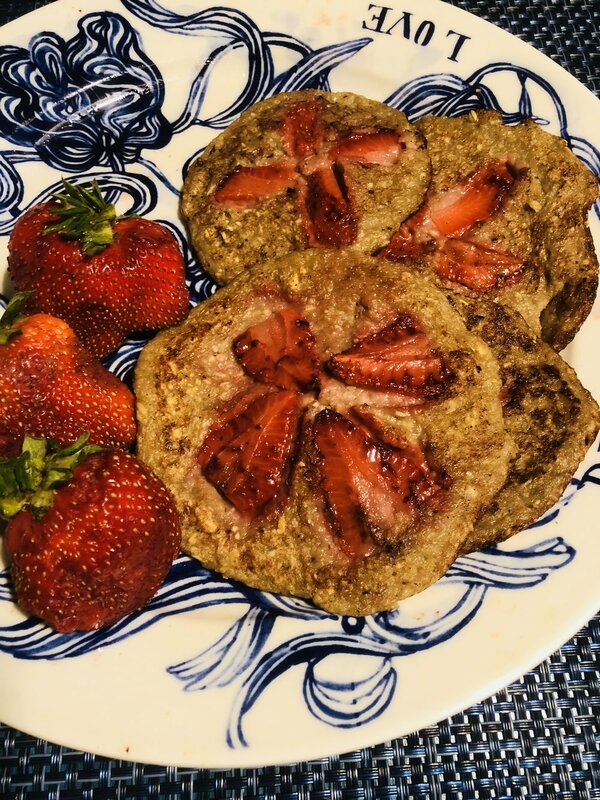 With the few left over berries I had, I created a paleo banana strawberry breakfast bread, speckled with chia seeds, that was moist and grain free. It tasted like dessert for breakfast! I whipped up a massive breakfast for one last weekend. I wanted to make sure I did what I could with the beautiful and full spring onion I received, green top and all, so I treated it as two separate ingredients. First, I sliced the onion bulb into large rings and coated them with seasoned panko crumbs. Those went into the oven to bake, alongside a tray of new potatoes, sliced, and seasoned with salt, pepper, and turmeric. With the green onion tops, I sliced and sautéd them in some oil, salt, pepper, and red pepper flakes for 5 minutes. Before serving, I tossed them in a small bowl with coconut aminos and a tsp of raw honey. Next up, a quick 3-minute sauté of the mizuna, a light mustard green that paired really well with my roasted potatoes. These delicate greens had a very special and distinct taste to them. They wilted much faster than spinach and had a thickness comparable to arugula, even lighter actually. What a vegetarian feast! The communication at Full Belly Farm was top notch. As a new CSA subscriber I received a phone call from a member of the farm. This established a point of contact and a more tangible relationship moving forward with the program. I received in-depth information about each produce item I received for my Full Belly Farm review. It was great to learn how to properly store my produce, and I appreciated all of the recipes on the website that were easily accessible and simple to recreate. I had a strong understanding of what was coming my way prior to picking up the produce box. I was also pleased with the variety. Full Belly Farm kept its promise to provide me with items that would be familiar to me, as well as a few that I had never tried before. This was my first time purchasing an add-on from a farms’ selection of other goods (baked, dairy, meat, etc), and I went with a jar of their homemade quince butter. It had the same texture as unsweetened apple butter and tasted very similar, too. I was very pleased with my choice and would definitely add-on again. Check out my final ranking of produce delivery services found here!